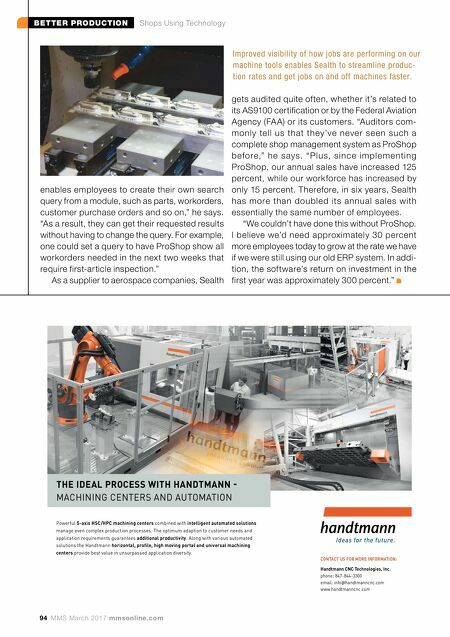 BETTER PRODUCTION Shops Using Technology 94 MMS March 2017 mmsonline.com enables employees to create their own search query from a module, such as parts, workorders, customer purchase orders and so on," he says. "As a result, they can get their requested results without having to change the query. For example, one could set a query to have ProShop show all workorders needed in the next two weeks that require first-article inspection." As a supplier to aerospace companies, Sealth Improved visibility of how jobs are performing on our machine tools enables Sealth to streamline produc- tion rates and get jobs on and off machines faster. Powerful 5-axis HSC/HPC machining centers combined with intelligent automated solutions manage even complex production processes. The optimum adaption to customer needs and application requirements guarantees additional productivity. Along with various automated solutions the Handtmann horizontal, profile, high moving portal and universal machining centers provide best value in unsurpassed application diversity. 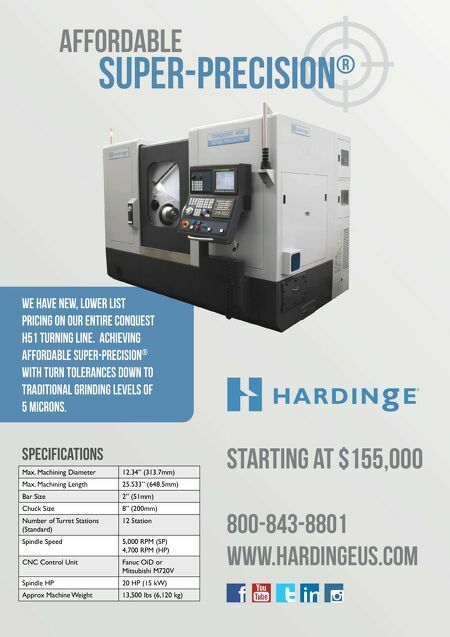 THE IDEAL PROCESS WITH HANDTMANN - MACHINING CENTERS AND AUTOMATION CONTACT US FOR MORE INFORMATION: Handtmann CNC Technologies, Inc. phone: 847-844-3300 email: info@handtmanncnc.com www.handtmanncnc.com gets audited quite often, whether it's related to its AS9100 certification or by the Federal Aviation Agency (FA A) or its customers. "Auditors com- monly tell us that they've never seen such a complete shop management system as ProShop b efore," he s ays. "Plus, sinc e imple m e nting ProShop, our annual sales have increased 125 percent, while our workforce has increased by only 15 percent. Therefore, in six years, Sealth has more than doubled its annual sales with essentially the same number of employees. "We couldn't have done this without ProShop. I believe we'd need approximately 30 percent more employees today to grow at the rate we have if we were still using our old ERP system. In addi- tion, the software's return on investment in the first year was approximately 300 percent."